Squirrels are among the most fascinating creatures to observe in their natural habitat. These playful, furry friends can bring hours of entertainment as they scurry from tree to tree, cheerfully chattering with one another. Getting started by installing a couple of squirrel feeders in your yard is a great way to attract wildlife for your viewing pleasure. One side benefit is that these feeders will often attract quite a few wild birds, the cheerful songs that these birds produce will brighten anyone's day. Enjoy peaceful mornings watching these crafty creatures, while you relax on your couch or deck. A well-placed squirrel feeder will not only help attract squirrels to your yard, but when placed far away from your bird feeders, they can also keep the squirrels from gobbling up all of your bird seed - check squirrel-proof bird feeders if that is a concern. If you want to know what squirrels eat , check out this article to get an idea. Squirrels are territorial creatures. When they get used to eating in a certain location, they are less likely to go to others. With so many squirrel feeders on the market, it can be hard to choose which one is the best option for you. When selecting a feeder, it is important to find one that is both easy for the squirrel to use and durable enough to withstand the elements and normal wear and tear from the animal. On the other hand, you could decide to get a feeder just for the entertainment! If you didn't watch the video above, please do! 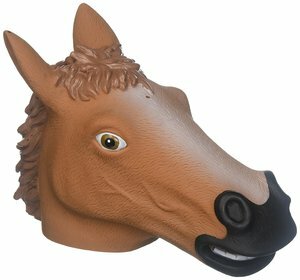 Very difficult not to smile while the squirrel tries to get a nut out of the horse head. These feeders are usually mounted from a string and hang down to where it is just in reach of a squirrel. Another factor to consider is that you shouldn't expect this to last too long. Remember that squirrel teeth continually grow and they need to bite and chew and gnaw on their environment to keep their teeth in-check and this bad-boy just doesn't have the muster to withstand the barrage that the squirrels can bring. The good news is that they are fairly cheep and provide a few chuckles! One of the most popular squirrel feeders on the market is the environmentally friendly Woodlink Going Green Squirrel Munch Box . It is almost entirely constructed from thick, recycled plastic. The attractive design incorporates an imitation woodgrain box, with a hinged lid and clear Plexiglas front for enhanced viewing. The outer ledge allows the squirrel to stand outside of the box while eating and also has a screw to attach a delicious corn cob for the squirrel to enjoy. This natural looking feeder is eight inches high, ten inches deep, and seven inches wide. It can hold 1.7 pounds of squirrel feed. The feeder can be easily attached to a tree or wooden post with the screws that are included. One of the feeder’s greatest qualities is its durability. Squirrels’ front teeth continually grow throughout their life, causing them to gnaw on everything. The sturdy plastic design is much more resistant to being chewed up than cheaper wood feeders. While it is high in quality, its cost remains very affordable. 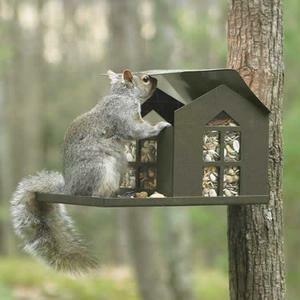 It is designed for squirrels to easily access the food, while keeping out larger birds, such as blue jays. Squirrels can easily lift the hinged lid to get to their food, but the self-closing lid will keep out unwanted pests. The box design allows you to fill the feeder with a wide range of squirrels’ favorite treats, including unshelled peanuts, sunflower seeds, and variety squirrel feed. The plastic casing will not absorb moisture like wooden squirrel feeders. This not only extends the life of the squirrel feeder, but also protects the food from mold that could harm the squirrels. The self-closing lid also helps preserve the food by keeping it dry. The plastic squirrel feeder is much more efficient than wooden feeders, but still may eventually suffer damage from squirrels’ continued chewing. However, the company has been praised by past customers for their excellent customer service, which includes a quick response time and free replacement of damaged parts. Another complaint that some customers have had is that the removable Plexiglas front has popped out on occasion. If this happens, it can be easily fixed by screwing it to the plastic casing. If you are looking for something even sturdier than plastic, this Erva Bird Proof Squirrel Feeder metal squirrel feeder is made of 18 gauge steel and provides the ultimate in strength and durability. Its strong construction makes it impossible for squirrels to chew it up. The feeder is twelve inches wide, seven inches high, and seven inches deep. The large design can hold up to two pounds of squirrel feed. The back plate can quickly be screwed to a fence post or tree, with the included hardware. This metal squirrel feeder has a very attractive appearance that will blend into any outdoor scene. The base of the feeder is shaped like a rustic house, with large windows on the front and sides of the feeder for unobstructed viewing. There is a ledge for the squirrels to stand on while they eat, but the feeder is also big enough for the squirrels to climb inside. The roof of the house is a hinged lid that these crafty creatures enjoy opening to get to their food. When the lid is opened or closed it makes a clanking sound, alerting you that there is activity in the feeder, so you never miss a show. It costs a little more than other squirrel feeders, but it is practically indestructible and will outlast feeders of inferior materials, making it well worth the additional amount. The large space allows you to fill your feeder with a variety of food options. 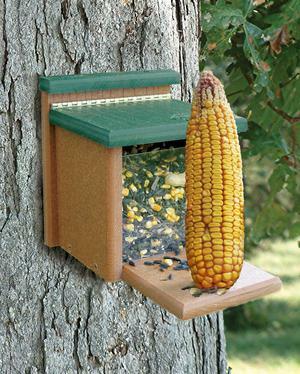 However, it does not have a corn cob holder like some other feeders. There is a small gap between the lid and the base, which could let some moisture into the feeder and also allow blue jays to be able to steal feed from the top when it is completely filled.